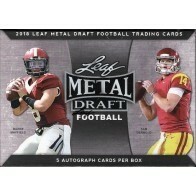 Leaf Is Pleased To Announce The Return Of One Of The Hobby’s Most Exciting Draft Releases Year In And Year Out, 2018 Leaf Metal Draft Football. Once Again, This Release Will Feature A Wide Selection Of 2018’s Elite NFL Draft Picks. As Always, This Release Brings Collectors On-card Autographs Earlier Than Anyone! While Checklist Is Currently Being Built As Players Become Available, Leaf Will Continue To Strive To Bring Collectors The Most Exciting Available Players In This Loaded Draft! Leaf Will Be Announcing Players Which Will Be Included In Its Hobby Products On A Regular Basis On Its Twitter Account, @leaf_cards.